Ok, say you find a set of cool old metal or cast iron patio furniture by the side of the road or on Craigslist. Or maybe you find your OWN set of metal patio furniture or iron bench under the snow! When you are ready to refinish metal patio furniture, it is important that you make the right start. You need to get down to bare metal without damaging the metal, causing pitting, or ending up with caustic and damaging chemicals leaking out of drain holes later. The best choice to refinish metal patio furniture is to start with a professional dry abrasive blasting job. Why? You can spend the money investing in these toxic chemicals, scrapers, and equipment. Then you can spend the time to DO the job (don’t forget the clean up!). Result? You will not get the smooth finish that professional abrasive blasting gives you. The better the surface preparation, the better (and longer!) the paint or powder coating adheres to the surface of the metal. What we do is sometimes referred to as “sandblasting” or stripping. Our methods of blasting don’t include sand anymore. Instead our experienced blasters determine what kind of metal and corrosion needs to be removed and select the best abrasive media for the job. Of course you could try to strip the metal yourself. But the time and effort and — most of all — the less-than-desirable result could really discourage you and set you back a season. That’s the best reason to use professional abrasive blasting for your job. The pros make quick work of your patio furniture job. When you are ready, we can get the ball rolling to refinish metal patio furniture. So what about the finish? Patio furniture requires high-quality outdoor paint or powder coating and a meticulous hand. Why? Sun, rain, snow are all hard on metal! To ensure you won’t have to repeat this coat job again next year, we recommend powder coating. 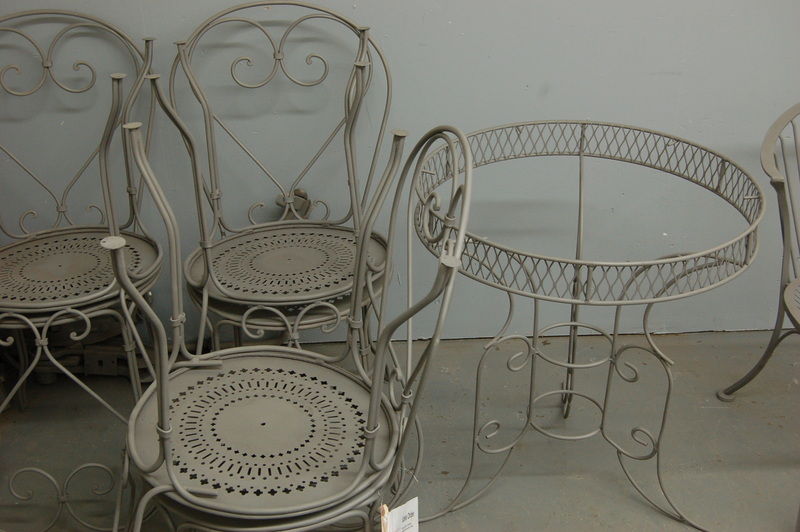 We offer in-house powder coating for metal patio furniture. Bring it in to us to ensure you protect your outdoor furniture investment. Ready to refinish metal patio furniture? Have a question? Will send you an answer via email. Thanks!